↑ 1.0 1.1 1.2 1.3 1.4 1.5 1.6 1.7 United Nations Treaty Collection. 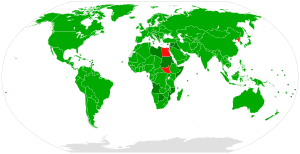 Convention on the Prohibition of the Development, Production, Stockpiling and Use of Chemical Weapons and on their Destruction. Accessed 14 January 2009.